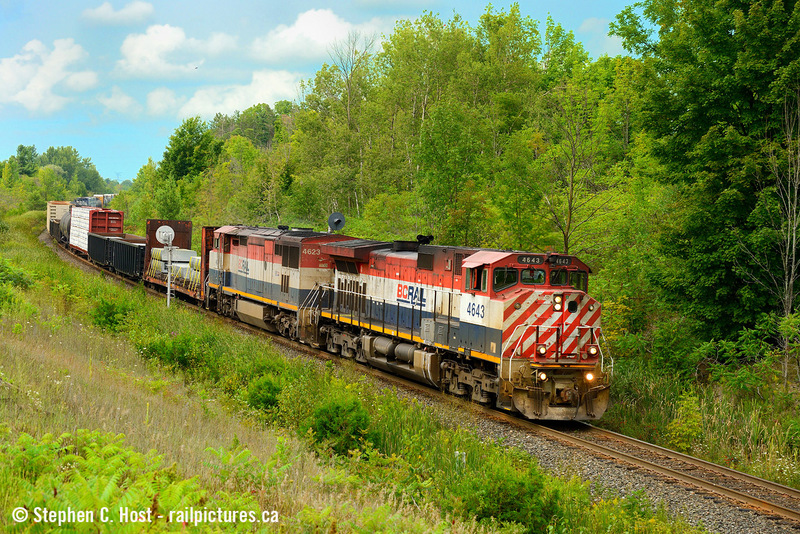 Railpictures.ca - Stephen C. Host Photo: Here’s a nice after work suprise, after BC Rail was taken over by CN, it took me about 2 years to get my first BCOL leader, but it took me another 12 years to get a pair solo on a train – here it is. These Red, White and Blue locomotives may as well be Red, Yellow and Blue owing to dirt. And photographic notes – notice the forest fire haze lately? Remind you of the early to mid 2000′s when coal burning was at peak? Well, if I may, young photographers would be VERY wise to invest in a good polarizer lens to cut the haze and bring out the contrast and blue sky. Get one ASAP, this haze isn’t going anywhere for a while yet. My Circia 2001 B+W C-POL by Schneider Optics (Germany) is a godsend and I’ve used it on a few photos on this site to great effect. Retail price for a good polarizer is about $150 USD. Don’t skimp when buying filters, the last thing you want are artefacts like headlight reflections, which ruin photos. If you want any blue sky in your afternoon photos, this is now a must. | Railpictures.ca – Canadian Railway Photography – photographie ferroviaire Canadienne. Caption: Here's a nice after work suprise, after BC Rail was taken over by CN, it took me about 2 years to get my first BCOL leader, but it took me another 12 years to get a pair solo on a train - here it is. These Red, White and Blue locomotives may as well be Red, Yellow and Blue owing to dirt. And photographic notes - notice the forest fire haze lately? Remind you of the early to mid 2000's when coal burning was at peak? Well, if I may, young photographers would be VERY wise to invest in a good polarizer lens to cut the haze and bring out the contrast and blue sky. Get one ASAP, this haze isn't going anywhere for a while yet. My Circia 2001 B+W C-POL by Schneider Optics (Germany) is a godsend and I've used it on a few photos on this site to great effect. Retail price for a good polarizer is about $150 USD. Don't skimp when buying filters, the last thing you want are artefacts like headlight reflections, which ruin photos. If you want any blue sky in your afternoon photos, this is now a must. Snake sorry can’t see it, not a member. Note that I re-edited this photo a second time after submission. Again, the haze and associated white balance caused yellow to show up on the shot after editing, because the haze essentially is a yellow filter. I edited it to correct to white. It was a very challenging edit to say the least. TY all. Very nice catch Stephen. Can you demonstrate a photo without a filter then one with? Great looking consist, what a catch. The surrounding greenery with make these units feel like their on former home territory. Phil, check now. Press CTRL-F5 to force re-load the image into your browser’s cache. I thought about the yellow tint and I also realized any tint is fixable, it’s no different than a white balance issue. So I made an adjustment to white balance using the BCOL white in the whitest part of the locomotive. I first tried using a neutral point (greys) which almost always fix a tinted scene but this did not work. It was a bit more difficult than usual, this yellow tint is just odd. I’ll have to watch for this on other photos taken the last couple weeks and going forward until the haze is gone. Thanks, i have not noticed it that much in scarborough or when i am working in the downtown core last week. I think its supposed to rain tomorrow but i will pay closer attention when i am at work in Oakville tomorrow. Maybe its the haze? It is kind of yellowy orange and its not exactly ideal shooting conditions out there. I find the polarizer on a good day to make things bluer. But these forest fire haze days are challenging to say the least. Wow great image, congratulations on all counts. It also cuts reflections off foliage – greens become darker (less white reflected off objects). Tank cars also go from a dark grey to black again, cutting the white reflections. It’s not to be used in every situation, as a polarizer lens will also cut light (meaning you have one or two stops less light) but it is the only filter I use in my kit on a regular basis.